The holiday season is in full swing, and we expect you’re on your best behavior to make Santa’s nice list. But there’s one famous guy who works harder than anyone else to be naughty this time of year, and that’s everyone’s favorite Dr. Seuss anti-hero, the Grinch. Mileage. The Grinch can choose to deduct “actual expenses” (maintenance, upkeep and depreciation on his ramshackle sleigh) or the standard allowance (currently 57.5 cents per mile). In the Grinch’s case, the short trip down from the top of Mount Crumpet to Whoville makes actual expenses his best bet. Uniforms and Work Clothes. Uniforms the Grinch provides for himself are deductible so long as they’re not “suitable for ordinary street wear.” This time of year it seems like everyone enjoys a red coat and hat. Still, we think the Grinch’s fake-Santy Claus look should be distinctive enough to pass the IRS test. Meals and Entertainment. Feeding all those Whos at the end of a long day can’t be cheap, even if you opt to save a little by carving the roast beast yourself. The Grinch can deduct 50% of all meals and entertainment he hosts, down to the last can of Who Hash. That’s exactly the sort of subsidy that helps the Whos feast, feast, feast, feast. Medical and Dental. Speaking of the Grinch’s smile, have you noticed how awful the Grinch’s teeth are? With just a little planning, he could set up a Medical Expense Reimbursement Plan and deduct the cost of straightening and whitening those choppers! Here’s another reason for the Grinch to be happy that his heart grew three sizes that day — and he gave Christmas back. If he really had stolen Christmas, he would have owed tax on it! Ill-gotten gains are just as taxable as any other kind of income, right? We imagine all those flu floopers and tar tinklers would be treated as ordinary income — but who knows how an auditor would treat a set of silver jing tinglers, or a rare zu zitter carzay? This holiday season, we wish you and your family all the best. And remember, don’t hesitate to call us with any year-end finance questions! 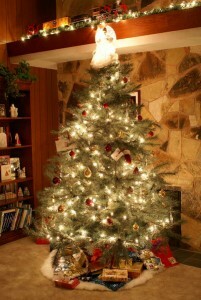 * Photo Credit – An American Christmas Tree licensed under the Creative Commons Attribution 3.0 Unported license. No changes were made. Author – DR04.